Anniversaries are special occasions indeed; they're commemorations of a couple's successful journey throughout all the challenges thrown by life and their commitment towards each other. Anniversaries should always be celebrated, particularly when specific milestones are crossed in terms of the number of years that a couple has been together. Are you thinking of the perfect anniversary gifts for your spouse and your parents/friends who have anniversaries coming up? Here's a guide towards the best wedding anniversary gifts by year for all your near and dear ones. - The 1st Anniversary is undoubtedly super special and is treated as such by the young couple in question along with all their family and friends. What is the traditional anniversary gift? A handwritten note along with a bunch of fresh flowers of course! When it comes to your spouse, you should definitely gift her a bunch of gorgeous roses which are unparalleled when it comes to romanticism. Get him/her a personalized photo cushion which will light up your bedroom without a doubt. You can also pair these with a personalized couple mug that you two can treasure for life! 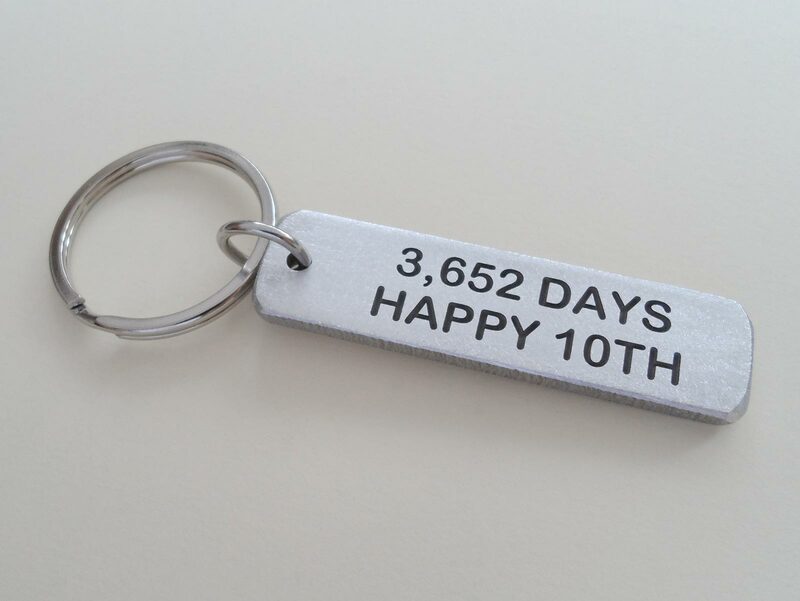 If you are wondering what to gift your husband for 1 year anniversary, you can get him a customized t-shirt with a cute message or a customized keychain. 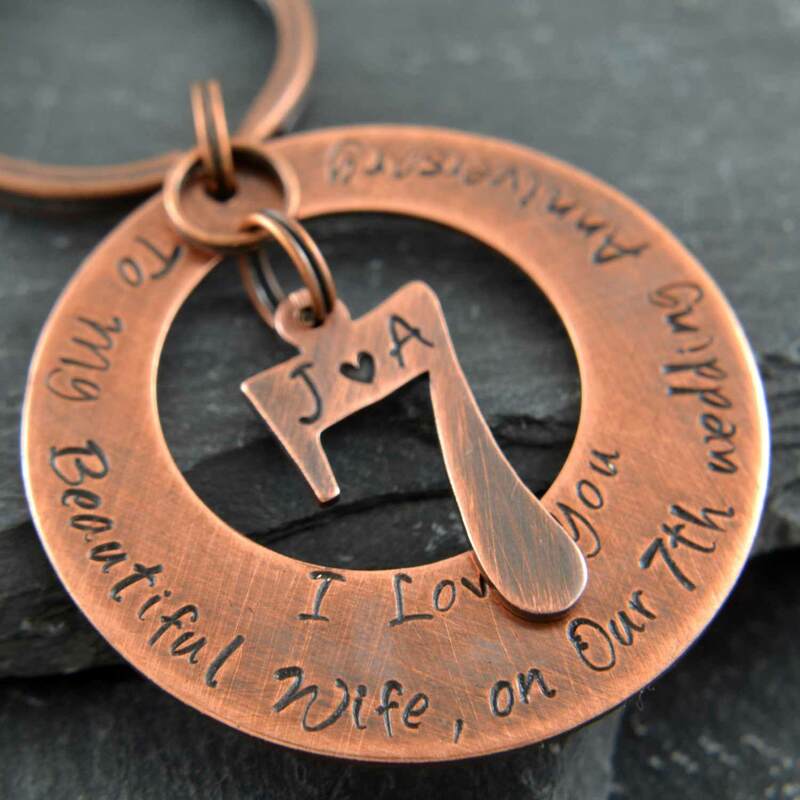 Wives can be surprised with jewellery and personalized letter coasters among other innovative gifting options. In case of your friends, you can surprise them with cute lamps that can be personalized with funky messages. This will certainly make them smile! The 5th Anniversary is when a couple has reached a certain level of maturity and understanding after those early years. When it comes to your spouse, you can opt to surprise him/her with a lip-smacking Black Forest Cake or a cake in any other flavor that she likes. You can pair this with a personalized plaque that speaks volumes about your love and commitment. This will be supplemented nicely by a personalized wall hanging that can display one of the best photos of the two of you together. Your better half will definitely go wow at these surprises. In case of your friends, try giving them something out of the box like a personalized t-shirt where all of you can write down your messages for the couple, wishing them the best and even pulling their legs a little in turn! And of course, ordering a good anniversary cake is a must for the party to begin! Once you have crossed the 7 year itch, a good 7th anniversary gift for your spouse would be a personalized phone cover. Take your pick from several attractive iPhone covers that come with awe-inspiring designs that he/she will absolutely adore! A wooden key chain can be personalized immaculately with a great photograph. You can think of gifting your friends a personalized photo poster and pair it up with some delectable chocolates! (Tin/Aluminum Anniversary) - If you're celebrating your 10th anniversary, it's time to go all out to make it doubly special! After all, this is a commemoration of a decade spent with your better half and you can think of surprising him/her with a grand bouquet containing the most beautiful roses, lilies and other flowers which comes with a heartfelt message and of course, a beautifully crafted decorative artifact or statue. Take your pick from religious/spiritual artifacts and other decorative pieces that he/she can keep at his/her workplace or favorite corner at home. When it comes to your parents, you can gift them a delightful Buddha idol which will add a certain solemnity to their living spaces and in case of friends, you can opt for vibrant candle holders or other gifting options such as a personalized garden chair photo frame that will add a quirky albeit exciting touch to any home! 15 years is a long time and deserves to be celebrated as much! Surprise your spouse with a terrarium that he/she will absolutely adore! Take your pick from Aloe Vera, Sansevieria, Syngonium and other plant and flower terrariums. Other options include a personalized wooden table top which has been crafted to perfection and showcases some of the best photographs of you two. For your parents, you can consider a beautiful hamper containing sweets and flowers in order to mark their 15th Anniversary. There are several choices available and in case of friends, you can opt for personalized and neatly designed chocolate gift boxes that lend a touch of class to the occasion. When it comes to surprising your hubby/wife on the 25th or Silver Jubilee Anniversary, you should certainly take it up a few notches! Choose a gift like a Swarovski Black Ganesha with dazzling crystals that make him/her feel just how precious he/she is to you! This is definitely going to be a gift worth remembering for ages! You can surprise your friends or parents with the right indoor plants. Gift your parents the perfect Combo of Luck complete with lovely Two Layer Bamboo plants for that extra stroke of luck, a white square pot and four baby Buddhas exquisitely crafted from ceramic. 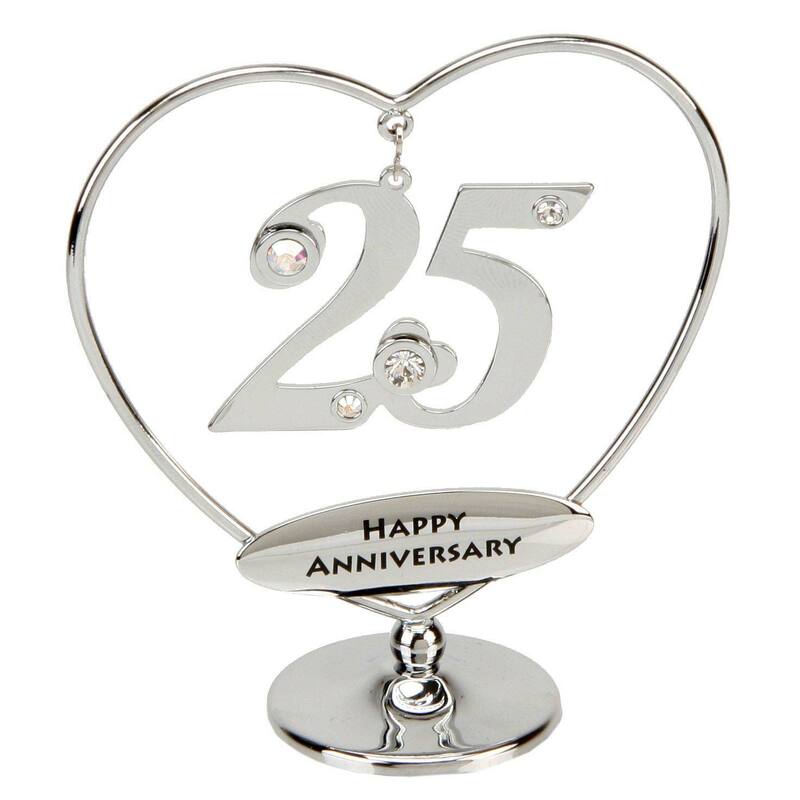 You can also give your friends something handy for their 25th anniversaries. For the man, you can go for the Blissful Relaxation hamper containing Beer Shampoo, After Shave Balm, Body Soap, Shampoo and more. For the woman, you can try Gold Plated Designer Earrings or even jewellery items like Fashion Statement. When a couple reaches the half century mark or their 50th Anniversary, it is certainly a massive achievement. For your special someone (if it's a she), you can choose a captivating gold plated jewellery set paired up with a gorgeous bouquet of at least 50 roses in your chosen colors! If it's a he, you can choose the Exotic 8 Layer Lucky Pyramid Bamboo Plant which is extremely rare and will be treasured by him always! In case of friends, you can opt for a Photo Cake with a fun photograph of the couple in question combined with a hamper containing chocolates, dry fruits, sweets and even a teddy bear! For your parents, the Money Plant in Designer Pot is a sheer work of art and will garner their attention instantly! 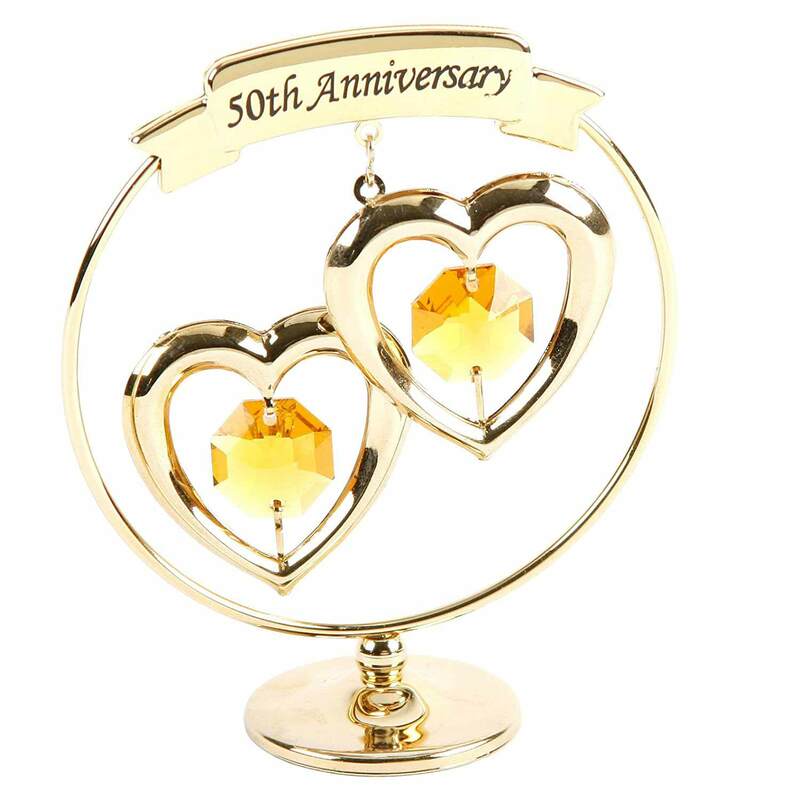 This is a classy way to wish your parents all the love and prosperity on their 50th wedding anniversary! A Quick Summary of the gift options for wedding anniversary by years! 7th Year Wool/Copper A wardrobe make over! 10th Year Tin/ Aluminum Car! 25th Year Silver A Foreign trip! !